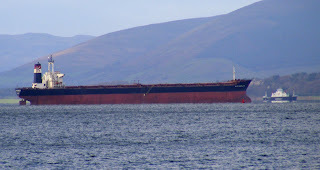 Bulk carrier Silver Constellation lying at anchor whilst repairs are carried out. 22 November 2008. Caledonian Macbrayne's Coruisk passing en route to Wemyss Bay. She is acting as relief for Bute (then for Argyle) to allow for annual overhauls.